Jalpaiguri: Bengal tourism department on Monday opened a wildlife tourism centre at Tilabari on the fringes of Gorumara National Park to attract more tourists to the region. "Tourists visiting the centre can learn about the flora and fauna of Gorumara National Park. 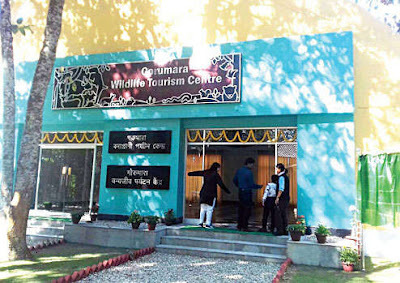 There are digital kiosks at the centre, along with models of different wild animals which will provide information about different species of trees, flowers and also about the wildlife which can be sighted at the park," state tourism minister Gautam Deb said after inaugurating the facility. So far, there was no such infrastructure in Gorumara from where tourists, nature conservationists and wildlife enthusiasts could get such information about nature and wildlife. "Many children want to know about trees, herbs, shrubs, flowers and fruits but have little information. They can spend good time here and can learn about these natural resources," said an official. In Tilabari, this is the second infrastructure that has been set up by the state tourism department. In September 2016, the department had opened cottages on the same site for tourists. It has become quite a popular place for accommodation for visitors these days. Hirak Mondal, an official of the department, said Rs 1.47 crore had been spent to set up the centre. "We had engaged a firm from Hyderabad to develop the centre and install sophisticated facilities like kiosks. Also, the models of wild animals put on display will attract tourists, particularly children, as they can know about the habitat and other details of these animals during their trips," said Mondal. Bengal tourism department on Monday opened a wildlife tourism centre at Tilabari on the fringes of Gorumara National Park to attract more tourists to the region.